Popped in small batches by hand using just a few organic and non-GMO ingredients, KettlePOP is the very first and ORIGINAL kettle corn. Old time “sugar corn” has been around for hundreds of years. The old time sugar corn that our ancestors ate was just that "Old Time Sugar Corn," not kettle corn! Contrary to popular belief, Kettle Corn does have a beginning... and it began with KettlePOP! You may have noticed on many web pages that "a Missouri farmer" or a "Midwestern farmer" popped sugar corn in a large cast iron kettle over a wood fire and began selling it at various shows. That farmer is Bill Mann, father to Gary Mann who is President of The Original Kettle Korn™. In 2008, Gary Mann retired from the kettle corn business and passed on the reigns of superior quality kettle corn equipment to the next generation of kettle corn experts, KettlePOP. Based in the San Francisco Bay Area, Kettlepop IS kettle corn. With decades of combined experience in kettle corn production, manufacturing, packaging, sales, and distribution; the KettlePOP team knows kettle corn and knows the kettle corn business! It's what we do! 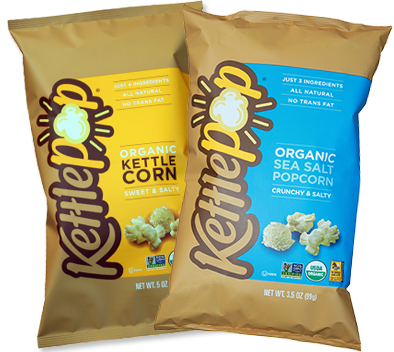 KettlePOP has been, and continues to be, an iconic fixture at farmer's markets, and is proud to offer their kettle popped corn, in organic Kettle Corn and Sea Salt varieties at retailers nationwide. These organic varieties are hand-popped in a fire-burning with the same attention and care given to our farmer's market batches. KettlePOP’s Sea Salt variety, made with just three ingredients: organic corn, organic sea salt, and organic soy bean oil, contains just 55 calories per cup and zero grams of sugar. Our signature Kettle Corn is made with the same three organic ingredients as the Sea Salt, with the addition of the finest organic cane sugar. It contains just 67 calories and eight grams of sugar per cup. Both the Sea Salt and Kettle Corn varieties are a great gluten-free source of whole grains, containing over sixteen grams per serving. The amazing taste combined with the low calorie, and high nutritional content make KettlePOP an ideal treat for popcorn lovers and dieters alike. First, we scour the globe for the best organic, non-GMO ingredients and work closely with farmers to ensure that only the highest quality corn goes into each bag. Next, we hand pop each and every kernel to perfection in a patented fire-burning kettle just like the ones you see at your farmer’s market. Finally, we infuse, never spray, the popcorn with preservative-free flavorings. Our Products are, well, delicious and leading edge. And just like any snack product – the better tasting, the more people are hooked and want to eat them.